Preheat oven to 180ºC (for a fan oven). Mix the flour, cocoa powder, baking soda and salt into a medium bowl. Move aside. Cream the butter and sugar in a large bowl with an electric mixer on a medium speed for 5 minutes or until light and fluffy, then beat in the egg. Make a thick paste by mixing cocoa powder, vanilla extract and red food colouring. Add the red cocoa powder paste to the butter mix. Add half of the buttermilk and flour, then mix. Pour in the rest and mix until smooth. Spoon the batter into 12 cupcake cases, filling each to 2/3 full. Bake for 20 minutes. Cool on a wire rack for 5 minutes. Cut out a cylindrical hole in the middle of each cupcake, slice the top part of the cylinder and save the tops. Fill the middle with sprinkles then put the tops back on. Pipe buttercream frosting on top of the cakes and chill for 30 minutes. Melt the mirror glaze according to the pack instructions, dip the cupcake in and cover the frosting evenly. Touch up the mirror glaze to cover the rest of the cupcake. Gently melt the marshmallows and once sticky, use your fingers to stretch it out to create a spider’s web effect and wrap around the cupcake. 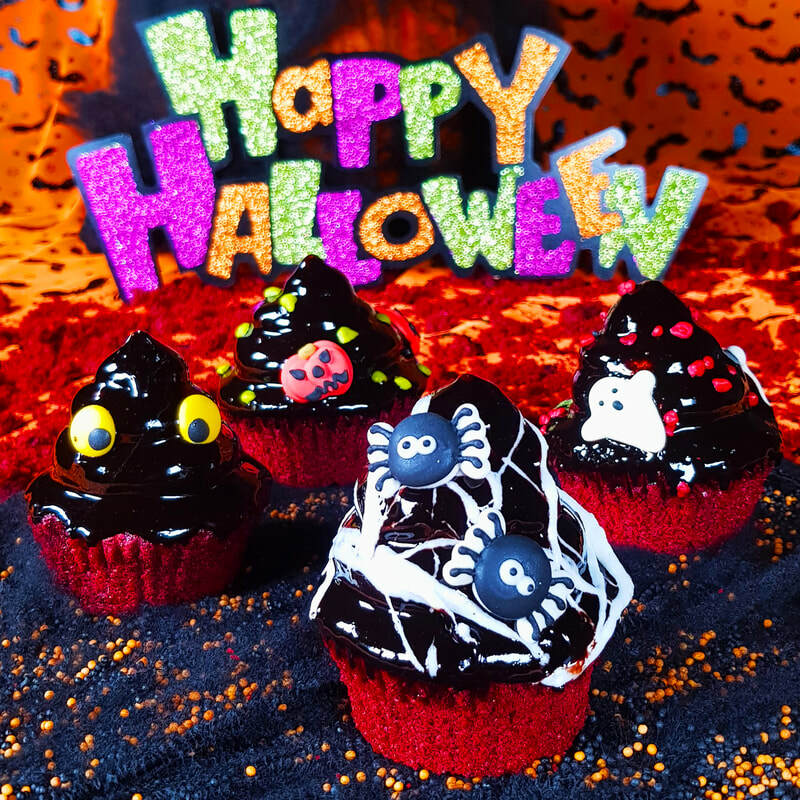 Add Cake Angels Trick or Treat cake decorations and more sprinkles!